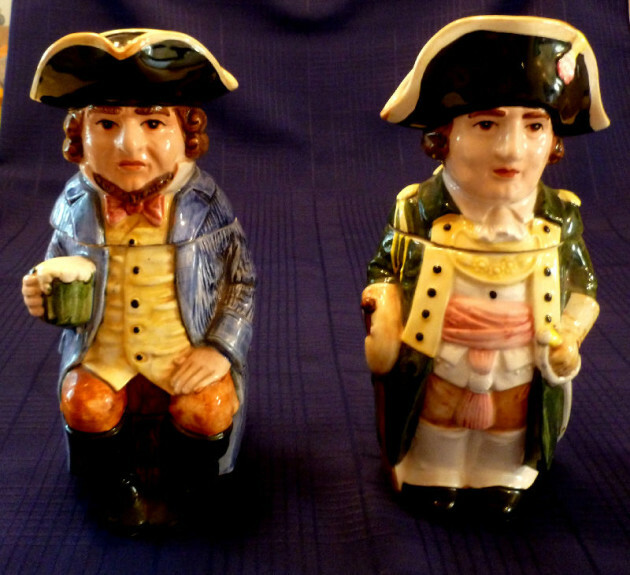 Englishmen drinking from humpens? ….most likely just the beer server!! Hachiya Bros – Japanese new character steins = very bright colors. These are not Toby mugs!! 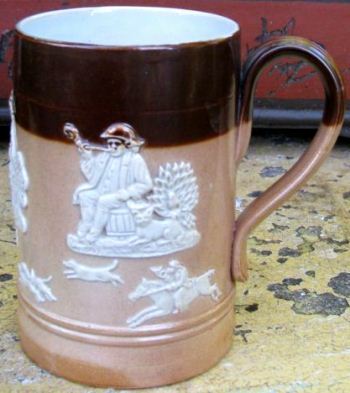 Hafnerware / Habnerware steins – Older pottery which had a lead glaze applied to the outside making the pieces very shiny in appearance. Very similar to majolica. Made in the 1500-1600’s time period. 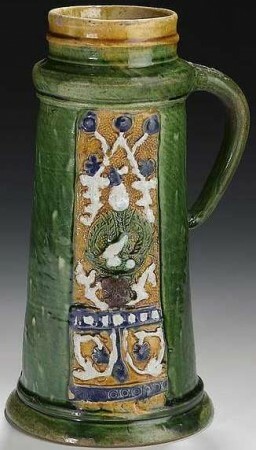 It predates the much *newer” German fayence [faience] which uses a tin glaze. 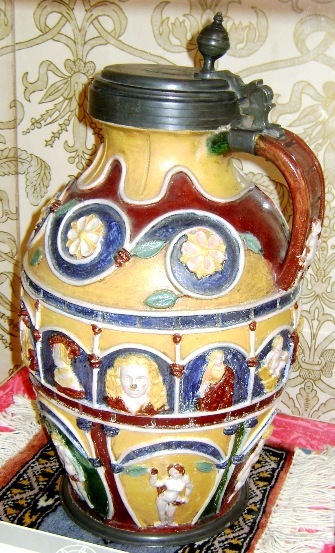 Shown above: A 16th century, 7 liter jug, from Nurnberg. 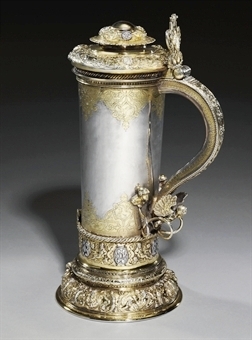 Shown ▲: A Hafnerware lidless stein made in Austria, second half of the 16th century. 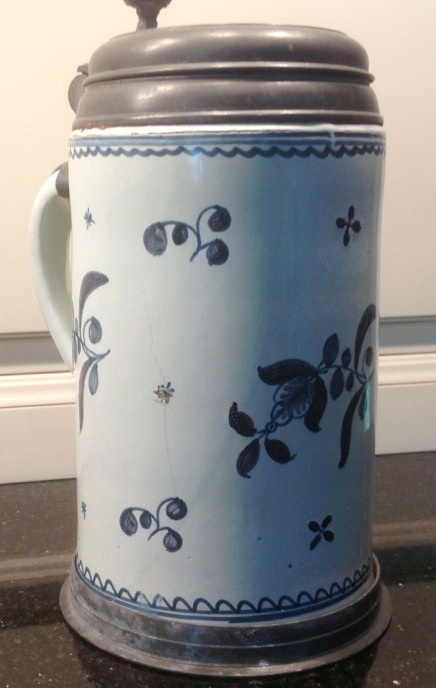 Shown ▲:-A “historismus” version of large stein in Habnerware. 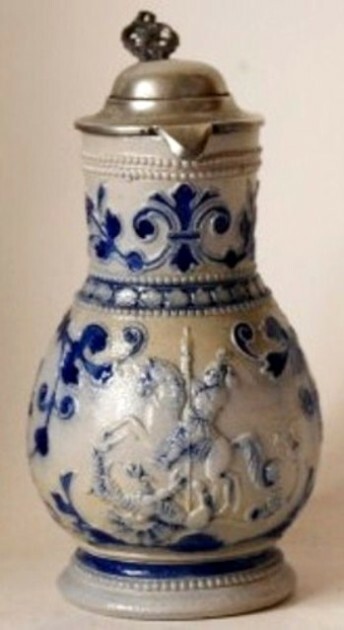 18 inches tall – even this copy sold for over $2k in Germany in 2011. Haida [the town is now called Nový Bor] glass – A Relatively famous (glashutte in Bohemia, at least very collectable products ) Above▲: A typical souvenir pokal; C.1930. Lots of this style [mostly ruby stained] were imported and sold here in the states. 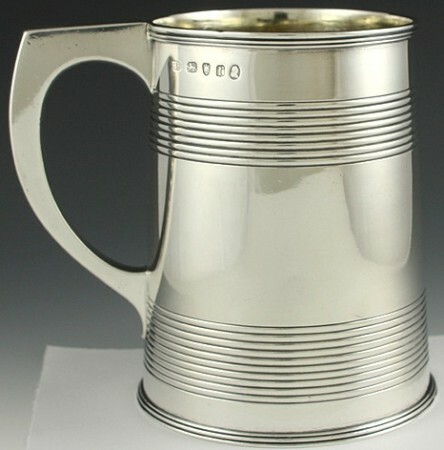 This stein’s “Hairline” is barely visible but runs from one design of the four berry and stem, just left of center, to the one below closer to the pewter base rim. 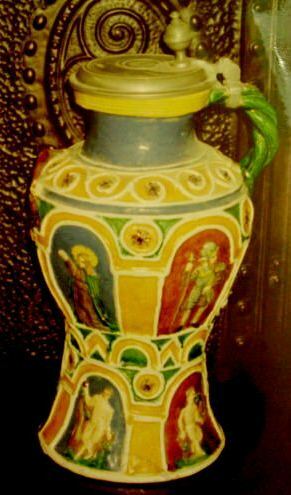 A German Faience stein Ca. 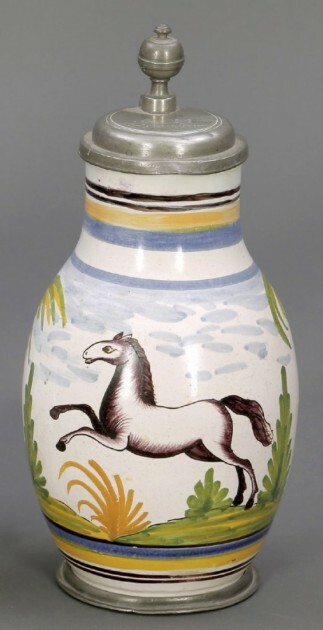 1790’s. Halberd / Halbert- A hand weapon consisting of a long pole fitted with a metal head; the head consists of a blade similar to an axe and usually a spike or hook. 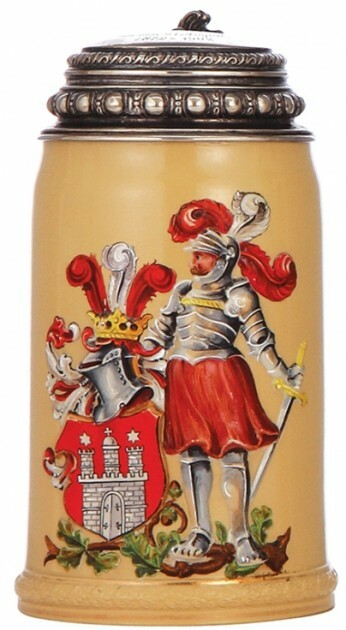 A stylized halberd is seen ofter being held by a lion on wooden steins made in Norway for the Baltic trade. 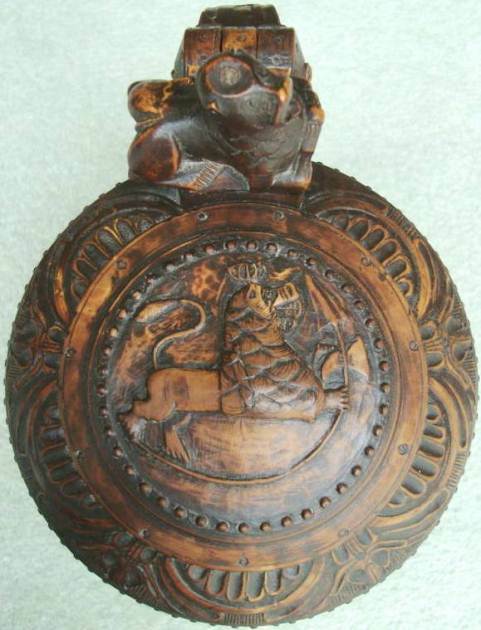 Shown ▲: The lid of a dated in the 1740’s Norwegian wooden tankard with its lion holding a curved Halberd. Hall in Tyrol” – Glass firm in the city of Hall, Austria which was started in the16th century. 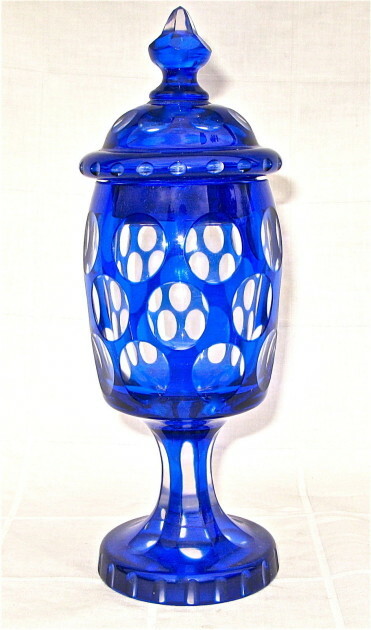 Very famous area for making “Façon De Venice” (“In the style of Venice”) glass. 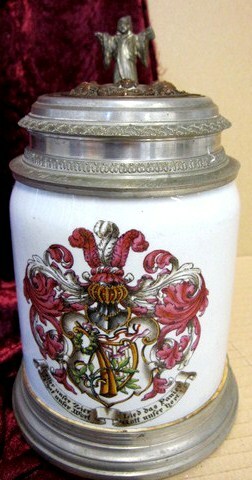 Shown ▲: A 21 inch tall, very light in weight, glass pokal with a cold painted Italian family’s Coat of Arms. Most likely made in “Hall -in-Tyrol”, which would have been fairly close by to Italy. Circa 1580. [FWTD] Photo shown in relative size of the piece. Hallmark – A famous USA greetings card firm. 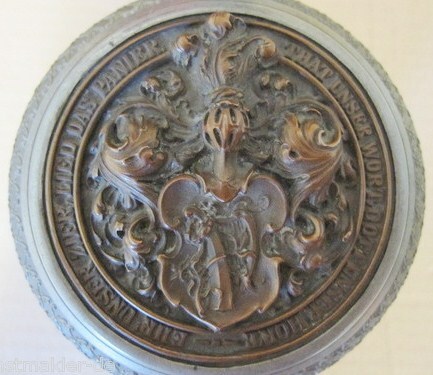 Oh, and also combinations of the following: the quality mark, makers mark, city mark, and date mark, stamped on English, Continental Scandinavian, and Russian silver items. Above▲: An English lidless tankard as they call them or a Cann. 1700’s. 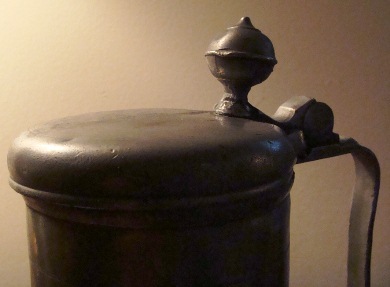 Stein above ▲ is made by the stamped silver process and not hand repossed and chased. 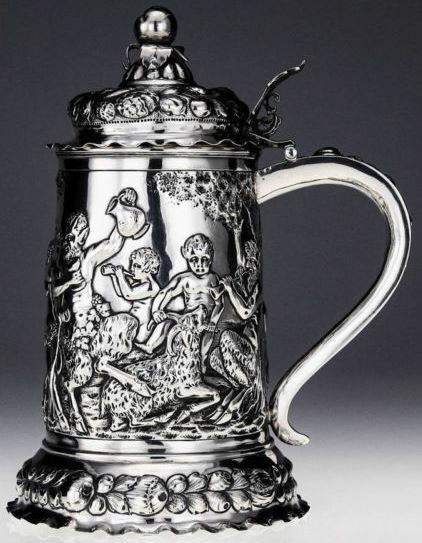 It is one of a cheaper series of steins produced by one of the Hanau silver smiths. the series shows about five different scenes! (The most popular is of General Tilley riding his horse. As I run across them I will add then to this page. They have been priced on eBay from $2000 to $14,000,00 which is absolutely ridiculous for a stamped silver piece. It didn’t sell! Handarbeit – “Hand made’ in German. Unless you take this to be “Individually made” ,a mostly useless term. It defines nothing as most steins were done by hand. 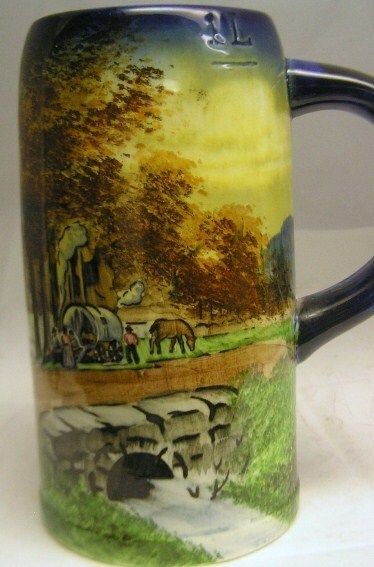 then production line assembled, painted and touched by many hands.. Used mostly on steins made after World War II. 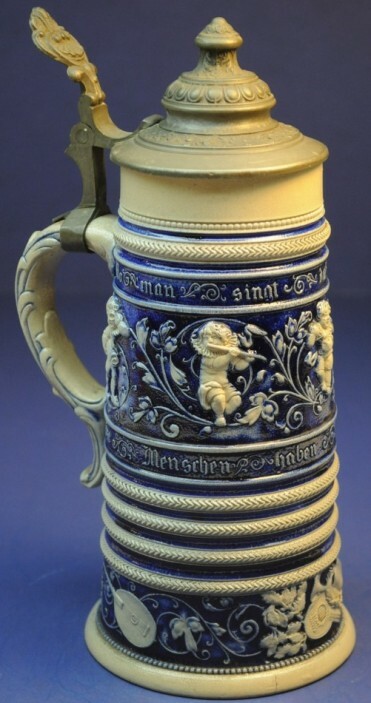 Handle hump- A small protrusion on the inside of the handle to making the stein easier to hold. While most of the early “Regimentals”(Reservist’s) reproductions made in the 1950;s through the 1970’s have handle humps! Some regimental makers even got up to three humps, more like a custom pistol grip. 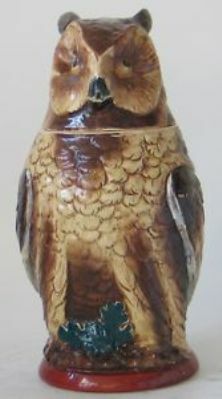 But – the practice was started much earlier by some Westerwald potters. Handle hole – See “Anchor Hole. Handgemalt = “Hand painted” in German. 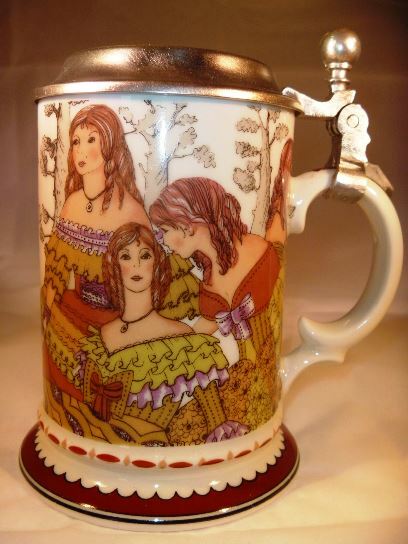 – Also used on steins made after World War II, found on some pottery relief steins where the under glaze colors are applied by hand, an operation which bears little resemblance to what we think of as hand-painting. 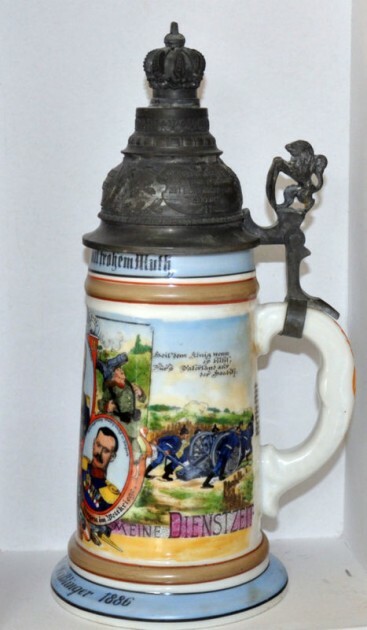 When seen on the bottom of a “reservist’s stein,” as shown above, it is an indicator the stein is a reproduction. 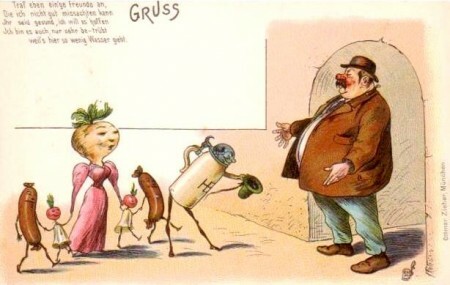 Shown: PUG of “Upside down” steins on a cupboard in a monastery. 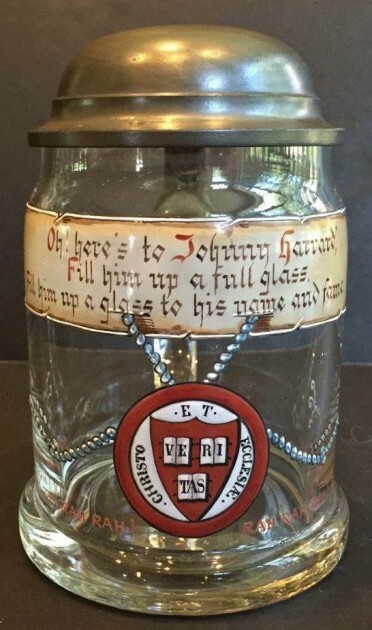 On a half liter Lenox (CAC) stein, American made porcelain, with a copper lid. Circa 1895. ▲ One liter relief of the Imperial German Adler (Eagle). Hanke. Very well done . An always popular St. George and the dragon in relief stoneware by Hanke. This saint is always a best seller. 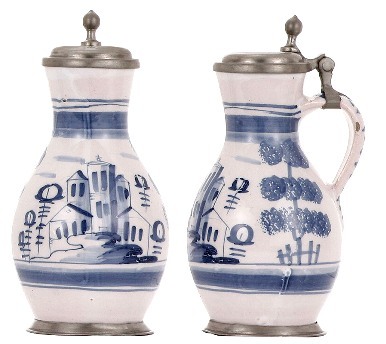 Hannes & Wieninger – Decorators of steins, Shown: A hand enameled Villeroy & Boch Mettlach stein for a musical society. A very nicely done “Bronzed” (but not bronze!) lid insert to go with the stein. Same society’s symbol. Hanse (or Baltic ) silver steins. 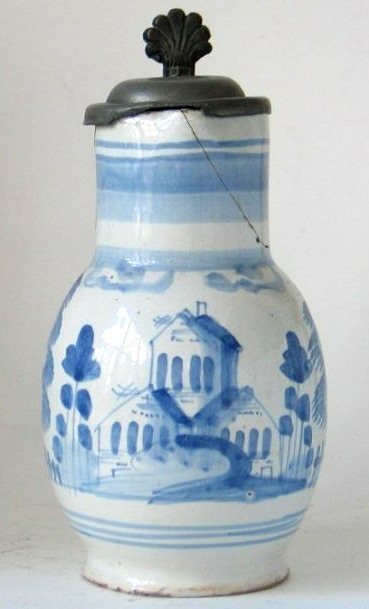 – Tall thin van shaped silveer pieces distinquished by applied relief bands and a pomegranate finial on the end of an elaborate design of curved silver wires emanating from a ball finial placed about two thirds down the handle . These are very rare,!! and rate a 10 on the Smith Paratore scale. So called very tall and fancy bodied silver steins, usually gilded on parts, from the 1500’s that were made in the Baltic states / cities that were part of the Hanseatic League. They have very unusual handle finials of small balls [pomegranates?] at the end of thick bent silver wires, as shown above ▲. 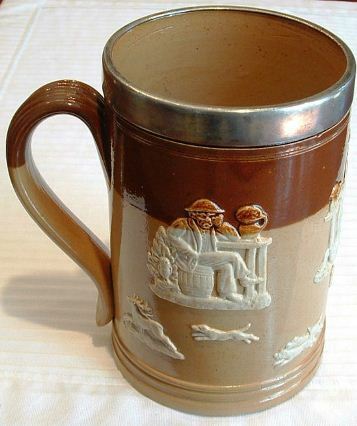 “Harvest Ale” Ware – Name of a type of stoneware made by Doulton Lambeth in England, in which the body colors on the mug are split in two = upper and lower. Usually dark brown on top and tan on the bottom, and sometimes with a silver rim as shown below. Applied reliefs in white showing gentry scenes are attached by slip. So what exactly is “Harvest Ale?” I did not know either, so I looked it up. Here’s at least two versions from “Lee’s Harvest Ale” web site, thank you Lee’s ! Seasonal brews have been with us since the earliest midst of brewing time.Beers to mark a specific ceremony or event have their origins in our earliest form of communal living. Whether to celebrate the joys of a forthcoming nuptials, or to mark the more sombre affair of the annual Audit, in nearly every case a special beer was required to mark the occasion! Some however are more specific, and have almost pagan roots, acknowledging the importance nature played in the annual cycle of our everyday existence – and ‘Harvest Ales’ are one such beer. As a style however it seems to have followed two distinct historical paths. 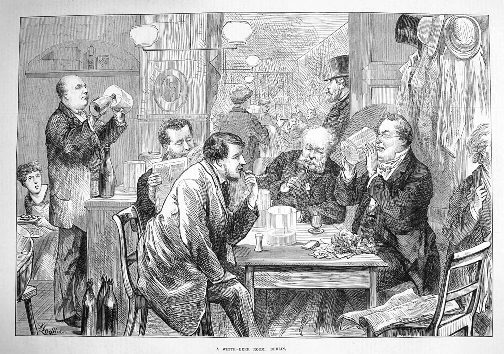 One interpretation of ‘Harvest Ale’ was for the the finished brews themselves to be brought to the farms by the Squire or Landlord during the harvest period as a gratuity for the workers to quench their thirsts! This tradition was still very much alive in the rural areas of Ireland in the 1950s and 60s with a story relayed to me by Mr. Maurice Morrison when harvesting malting barley in Midleton, Co. Cork. A small wooden barrel of stout (believed to be Guinness) was made available to the workers in the field – and went by the name of ‘Harvest Porter’ (being a lower strength version of the stout) – and was much appreciated by all concerned! The other tradition did not refer so much to the consumption of the previous seasons wares, but a celebration of the new ‘Harvest’ itself, and more akin to our ancestral roots, and in more recent times the brewers of the American West Coast have adopted a variation of this theme with new season hops, often unkilned, providing the link with the new born Harvest. In Britain however, whilst there are several brewers who produce variations of the style at the lower alcohol level, one beer in particular stands out as representing a tangible link with the past, by not just using new season hops, but malt also – Lees Harvest Ale. 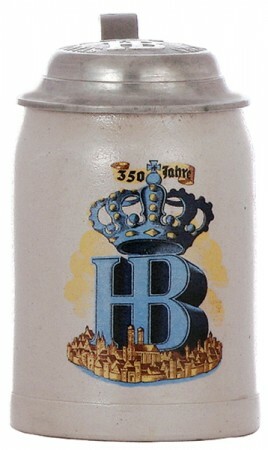 Hauber & Reuther, ( H-R)- A large volume beer stein maker / supplier. 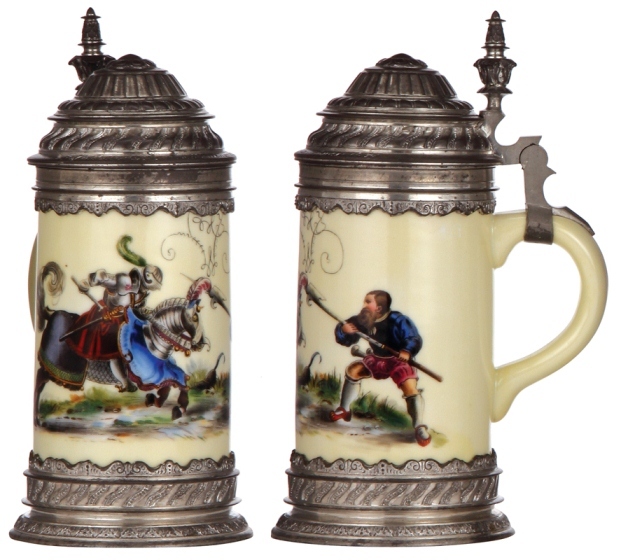 I am of the opinion that their best quality steins were almost as good as V & B Mettlach. Shown: [Top L] PUG, [Top R] Tapestry. [BL] Incised (“Etched”). HB (“Hofbräuhaus”) – The Staatliches Hofbräuhaus in München (state court-brewery in Munich.) One of the most famous beer drinking halls in the world, located in Munich. 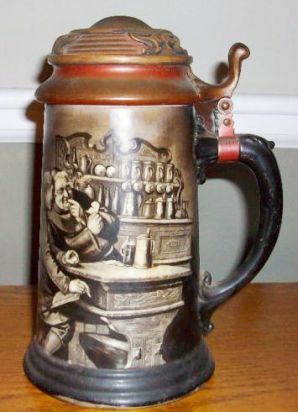 Steins made for this establishment were from many companies, over many years, and most were not paid for at the cashier’s desk while going to a new home! 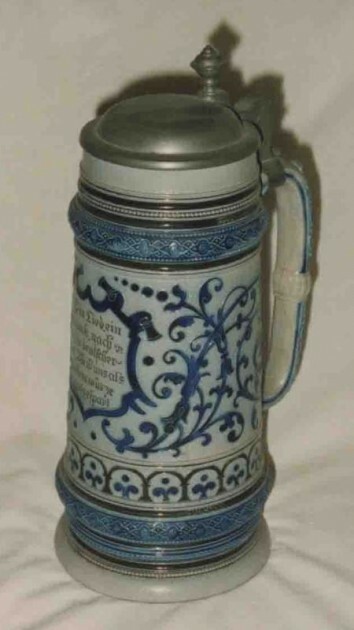 NOTE: I have included this site in the compendium as I think the research coming out of it will be interesting and useful for a lot of Brewery stein or Munich stein collectors. steveonsteins readers are urged to participate. Yes I know, she’s drinking the wrong (but another major) kind of beer at the Oktoberfest and not HB, but do you think I care? “If the number 2 pencil is the most popular, why i s it still number 2?